Beautiful boat that has been lightly used (only 125 hours!) by a meticulous owner and professionally maintained. Upgraded features throughout (professionally installed stereo system, pump-out head with 25 gallon holding tank, shower, sunpad on bow, refrigerator, stove and more) perfect for entertaining friends or just relaxing by yourself. The boat has a bimini top, a custom cockpit cover and a camper top for maximum flexibility. 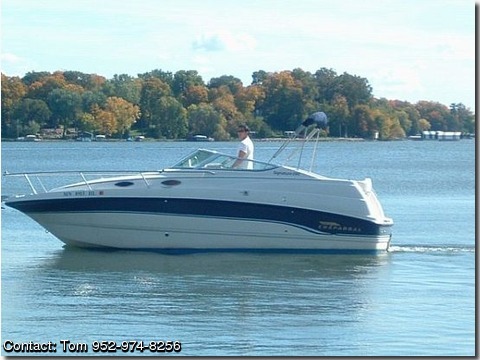 This boat is water ready for a day cruise or an overnight weekend excursion! Comfortably sleeps 4 with seating capacity in the cockpit for 10. The boat is being sold because the owner just does not use it enough. The Chaparral Signature 240 is a cabin cruiser intended for families. Equipped with an extended V-Plane running surface, the 240 is extremely dry riding and capable of handling bigger water than its centerline length would indicate. It is built with premium gelcoat, quad-radial lamination and AME resin. All of the hardware is stainless steel and the seats are made with 40-ounce expanded vinyl, including a double-wide helm seat that folds down to form an oversized sun lounge. The enclosed head has a shower and the galley is complete with alcohol stove and water pressure.